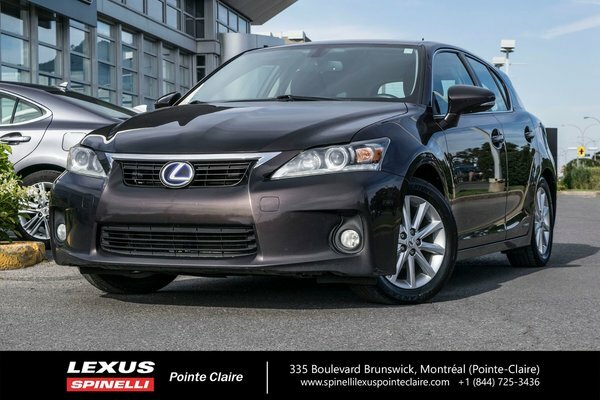 2012 Lexus CT200H in excellent condition. Well maintained. Trade taken in from customer from Quebec City area that purchased our 2017 CT200H. Never accidented. Carproof Vehicle History report available and free. Brakes changed by customer 1 month ago and service by our service department during inspection. Ready for on the spot delivery. Well equipped with dual zone A/C, nuluxe interior, heated front seats, winter tires on rims, and much more. We are open on week nights and Saturdays. Financing available. We want to buy your vehicle even if you don’t buy from us and even if your vehicle is leased. Professional evaluation in less than 15 minutes. Vehicle inspected by our certified technicians. Carproof available. Come see the vehicle and benefit from our friendly and stress free service. And if you ever change your mind, you have 5 days or 1000 km to bring back your vehicle and get a different one (See details at dealer). Buy with confidence from Spinelli, a family owned and operated business in Montreal since 1922. We are located at 335 Brunswick Blvd in Pointe-Claire right in front of Fairview Center Pointe-Claire, (one block north of Autoroute 40). "Was a wonderful experience for a first purchase at Lexus Pointe-Claire"
"Rolland Mailhot and his staff went above and beyond"
2015 Lexus NX 200t TOIT, CUIR, BAS KILOS! LEATHER,SUNROOF,BACKUP CAMERA,HEATED AND VENTILATED SEATS.